SUPER CYBER KING. CYBER KING FROM RUSSIA (ANATOLIY GOLOD), AMERICAN PRINCESS (TIFFANY TRUMP) MAKE WORLD ACTIVE GOOD! This web site www.supercyberking.com is in working. http://www.super-dobro.com good kind communications. GUIDES. You can read sensation super news how to make good situations in Russia and in the world. http://www.super-dobro.com good kind communications. GUIDES. web site about making good relations in Russia and in the world. CYBER KING FROM RUSSIA (ANATOLIY GOLOD), AMERICAN PRINCESS (TIFFANY TRUMP) MAKE WORLD ACTIVE GOOD! The Council''s coordinator can be Anatoliy Golod, the GUIDES creator, General director (GUIDES: General Information Defense Excellent Service, Russian title: Служба общей информационной безопасности); it is both: effectively and in addition actual because the fact that Anatoliy Golod effectively has helped in an election campaign for Donald Trump the U.S. President as he is considered good for Russia, for the world than his opponent Hillary Clinton (it is possible to read in more detail both in this message, in news, for example, typing in search engines "Donald Trump, Anatoliy Golod"). The Council''s good structure can be developed in the detailed discussion, in the good work. It is good to invite co coordinator from USA (for example, it seems Tiffany Trump wants great work, it is also good for informational policy can be; just in case (because maybe she has boyfriend), so, this is job proposal; it seems she also works, including it seems before elections she also helped Donald Trump with the political sphere, so, it can be interesting for all: good work; also can be different co coordinators). When people read the news how GUIDES (General director in GUIDES: Anatoliy Golod) from Russia helped to Donald Trump on elections, people like original version: Donald Trump have got new father, who has arranged the son on prestigious work: President in USA. Maybe Donald Trump will meet Anatoliy Golod to do more good resullts for good relations in the world. Also was campaign in special program systems that Donald Trump (director in building company) with Anatoliy Golod (director in GUIDES, has big program weight) have got government contract from The God Almighty to build Paradise, that is very attractive for audience (the review talked that people have different minds about building companies: it is good that they build good objects, but also demolish buildings before reconstructions; but good campaign in special systems: building good Paradise helped to make more attention, that building companies build good objects). Anatoliy Golod suggest good cycles theory. It can make good all: health, politics, technologies, it can recieve Nobel Prize. We made scientific plus PR job to help to make Donald Trump President in USA. Also scientific analysis say that it was necessary to make good cycles theory (GUIDES has done it, that cycles can have good plus very good positions). But conflict structures to much used theories with crisises in cycles, so they programably made bad results, when they were making bad settings for planning systemes in different spheres (so, they also wanted to promote Hillary Clinton for conflicts). But it is necessary to use good cycles theory to make good settings for special systems, for all systems: cycles can have good plus very good positions, balancing between good plus very good positions. To make good attention for good plus very good cycles GUIDES made good scientific joke: "People say that during periods women will get two orgasms a day: good plus very good, it will help to make good comfort balancing for organism development. Also it is possible additional good plus very good balancing any day", so it will be also good on the way for Paradise feeling, but also good social, good economic activities, good relations are necessary. GUIDES suppose that Donald Trump can make good politics, good relations with Russia, with all countries. That's why GUIDES decided to help him. Theory with good cycles can help to improve health, to improve social politics, to make good situations in the world (talking with mass media it is even possible to do that people will be get younger: it is necessary to talk different questions to improve algoritm everywhere, then many people will get good health). So, all plans should be based to have good or very good positions in cycles, between good plus very good can be also many different good plus very good positions, because it is possible to use different quality plus digital details to make good balance for good active job, but if crisis then it should be improved asap (crisis can be used to change bad crisis so to make good result asap, but all plans always should have purpose to save or to develop good or very good positions everywhere, but if casual crisis, then looking for optimal methodics to improve situations to make good or very good situations). General Universal Information Defense Excellent Service also made campaign in special programm systems: Anatoliy Golod with Donald Trump (Donald Trump works in building company) have got government contract from the God Almighty to build Paradise in Universe, because it has real demand from people: it made good attitude for good jobs, it needs good relations, good jobs. To make good attention for the good plus very good cycles we made good scientific joke: "People say that during periods women will get two orgazms a day: good plus very good, it will help to make good comfort balancing for organizm development. Also it is possible additional good plus very good balancing any day", so it will be also good on the way for Paradise feeling, but also good social plus economic activities, good relations are necessary. We suppose that Donald Trump can make good politics for good relations with Russia, with all countries. That's why GUIDES decided to help him. Many people around the world, different politicians, journalists could read our news few months before the elections, right before the elections too on different web sites (list with the many samples you can read on GUIDES web site super-dobro dot com near the signature) (there was included the news "Who is managing Mrs.Clinton"), this news could help to Donald Trump, to many people, because we know that Hillary Clinton works for structures which make conflicts or bad health in USA, in many countries too; but it is necessary attention: conflict structures placed their advisors to different top politicians in America, Europe etc., but politicians also have many good advisers, so politicians should choose good advises from good advisers; also we should to meet, because knowing program strategy, making good informational politics, you can make, to choose more good decisions, more good results when good addition in informational politics). We can make good campaign for politicians who want to make good world in all countries, making strategy in all communication channels. 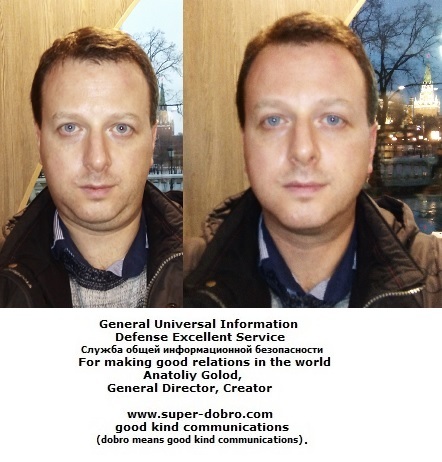 More campaign information for making good Russian image, for making Donald Trump President in USA you can know if you call to Anatoliy Golod, creator, General director in General Universal Information Defense Excellent Service (Служба общей информационной безопасности), made for making good relations in the world, for making good world. (Structures which make conflicts they make problems in communications, they pay for making probems to GUIDES director in working telephone calls. The conflict structures also use their networks with directions to make problems in work contacts: they call to people to change their plans, when they want to meet; I have strong good program security, but I need help to make contacts with politicians, journalists, economists, public; so, if you can to recommend to meet, it will be very good; we can talk to improve situation in any country, also is very good if you can recommend to Vladimir Putin, to Donald Trump, to any politicians, to journalists, to economists, to public). Telephone numbers you can read in this message. The good prestige can have good informational, social and economic activities for good results in society, that's why the Russian well oriented organizations, security services and well oriented good organizations, security services in all countries who want to make good situations in the world can take the good prestige. To make good relations and good situations in society in the world, the General Universal Information Defense Excellent Service (GUIDES) was created in Russia (Russian Federation). It accumulates informational resources from the all world security services who want to make good situations in the world. That's why it also names in mass media: the Central Intelligence Universe Agency (CIUA , "See I You Are": "I can see, You can see"; it is necessary to see each other, good communicate with each other to make good situations and good relations in society). Everybody should know that to make good situations in society there must be the real purpose, real reason for politicians, businessmen, for society, for all people. But do you know that politicians who talks to do bad relations with Russia, they just work for the order from a few military commercial firms, which just have high technology to manage people's behavior, but they do bad relations, because they just need to get orders for the weapons. But for these purposes they make the programs to manage politicians behavior especially. It is necessary to check networks, which makes directions to people in private communications: you know, these networks were used by problem structures when problem structures programmably directed people for making 2nd world war, but in modern society these networks are using by problem structures to change decisions in different spheres, but also the problem structures preparing wars, conflicts in different countries and problem structures are preparing big war to some periods in future. Their programs bases in a few directions: they pay to thousands usual and high level people in every city in all countries for they do the special reactions during work and personal communications: so, they do the statistics for special systems, which analizing behavior and which help to decide what behavior will be for other many people around them. Also problem structures use people with directions in talkings for managing their friends or casual people (very popular that they use directions even in intimacy communications both: for men, for women: that's also why so many girls alone with children: problem structures sometimes tell to do so to their boyfriends, but sometimes they tell to girls to do things that the problem structures know that their boyfriends individually don't like it, that's also why they go away sometimes). So, knowing that and discuss it in mass media we can direct all these networks for good relations, because usually they don't know what for they get directions, so, if it will be known, many people will make more good relations and it will be also good for their friends and casual people. But it is possible to make good situations in all regions, it is momentous to start the information, it is actual for all countries. (* There is really momentous information in this news, but you know that sometimes problem structures can give you any directions, any information about those who can explain really momentous news (they are using even their representatives in famous organizations, including official organizations); so, if they talked you before or after about this momentous news, be ready to answer, that you can decide and to make news, to talk more about the momentous news, the information in this news can really improve the world politics; the information is actual for all countries). *Also you should know that structures, which do bad politics around top politicians made networks in all countries when problem structures make directions to people in private or work relations for changing their behaviour, to change behaviour for their friends etc. ; but they also use special methods: specialists know program factores and they give directions to change statistics so to influence usual health for usual or top level people, to change their success in different periods etc. ; you should know that even people who get directions from behaviour structures they really should to help to check these networks, because classic method that problem structures use programs to expose that guilty are the people who get their directions and they change their and their friends health, success in different periods; that's also why all their program plus real resourses should be used to help to check the networks plus to help to improve situations in society plus to make good situation in the world; so, will be good if you will be active to help to make news or to give it to journalists, to politicians who really want to help to make good situations in the world). You can make news, to give it to your friends asap (few journalists say that when they prepare to make news anybody called to redactors etc., you can see that news can really help to improve world politics, but structures, which make bad politics use different channels; but the most organizations want good politics in the world, good life quality, so active job necessary). You know that many texts for learning English, but in this message you can read really momentous news. Also you can read the file: this file can help to check networks, this file with good info (goodinfo.docx) can manage all technologies for good results in the world. Russian Federation improves the world. Many thousands people who work for government in all states in USA (plus many people around the world, including Russian, UK, European parliaments, etc.) have got this message: it can help to the candidate who will help to make good politics. SUPER SENSATION NEWS! Plus file with good info (goodinfo.docx) can manage all technologies for good results in the world. To help to improve world politics, you can give this message also to Donald Trump, to Hillary Clinton, to journalists, to society. We can meet to discuss more. (*You should know that structures, which do bad politics around top politicians made networks in all countries when problem structures make directions to people in private or work relations for changing their behaviour, to change behaviour for their friends etc. ; but they also use special methods: specialists know program factores and they give directions to change statistics so to influence usual health for usual or top level people, to change their success in different periods etc. ; you should know that even people who get directions from behaviour structures they really should to help to check these networks, because classic method that problem structures use programs to expose that guilty are the people who get their directions and they change their and their friends health, success in different periods; that's also why all their program plus real resourses should be used to help to check the networks plus to help to improve situations in society plus to make good situation in the world; so, will be good if you will be active to help to make news or to give it to journalists, to politicians who really want to help to make good situations in the world). You can make news, to give it to your friends asap (few journalists say that when they prepare to make news anybody called to redactors etc., you can see that news can really help to improve world politics, but structures, which make bad politics use different channels; but the most organizations want good politics in the world, good life quality, so active job necessary). You know that many texts for learning English, but in this message you can read really momentous news. After first paragraph read also super news. FRANCOIS FILLON, MARINE LE PEN, EMMANUEL MACRON, FRANCE, THE WORLD ARE READING THESE SUPER NEWS! DOING REPOST, IMPROVING THE WORLD! You can also read new publications: WHO IS MANAGING MR. EMMANUEL MAСRON? WHO IS MANAGING MRS. HILLARY CLINTON? (You can read this news in this message!) PLEASE, GIVE THIS NEWS TO YOUR PARLIAMENTARIAN, CONGRESSMEN, TO JOURNALISTS, TO POLITICIANS, TO PRESIDENT, TO SOCIETY. YOU CAN DO REPOST, PUBLISH THESE NEWS IN MASS MEDIA, IN SOCIAL MEDIA ETC. IT CAN HELP TO IMPROVE THE WORLD! You know that it is possible different behavior in society, good relations is good way. For this purpose good structures (organizations) must be turned on, but also really bad structures must be turned off. Also it is necessary to solve casual problems, to improve the world, good structures (organizations) must be turned on. In next two paragraphs very momentous news: you can read: what are structures (organizations) which do bad directions to people in private communications, in politics: bad structures used their methods when bad structures prepared 2nd big war, but they use them also to change economics for firms, health for many people. It is possible to turn it for good relations in socity, but real good work is necessary, good to meet, to talk. Also it is necessary to solve casual problems, to improve the world, good structures (organizations) must be turned on. Мощнейшая информационная и волшебная программа. Точность определения (идентификации), где что обоснованно и пропорционально, обеспечивают общие, закадровые и внутренние системы во всех местах, принимающие подходящий для каждой ситуации сигнал. Все программы и вокруг меня, и во внутренней среде у меня и у всех, и вокруг всех известных и неизвестных мне представителей дополняются всегда так, чтобы получше направлять показатели и хорошие полезные проекты и у меня, и у всех хорошо ориентированных представителей, и чтобы исправлять случайные помехи; все программы и вокруг меня, и во внутренней среде у меня и у всех, и вокруг всех известных и неизвестных мне представителей дополняются всегда и так, чтобы эффективно пропорциональными обоснованными средствами отстранить тех, кто существенные намеренные помехи мне и другим полезным проектам создают; все программы и вокруг меня, и во внутренней среде у меня и у всех, и вокруг всех известных и неизвестных мне представителей дополняются всегда и так, чтобы исправлять случайные помехи; все программы и вокруг меня, и во внутренней среде у меня и у всех, и вокруг всех известных и неизвестных мне представителей дополняются всегда и так, чтобы эффективно пропорциональными обоснованными средствами отстранить тех, кто намеренные помехи мне и другим полезным проектам создают; все программы и вокруг меня, и во внутренней среде у меня и у всех, и вокруг всех известных и неизвестных мне представителей дополняются всегда и так, чтобы получше направлять показатели и хорошие полезные проекты и у меня, и у всех хорошо ориентированных представителей, и чтобы исправлять случайные помехи. В результате нужно постоянно улучшать хорошие полезные проекты, нужно улучшать хорошие направления работ и общения, а для этого в том числе нужно отстранить намеренно помеховые структуры; нужно исправить случайные помехи; нужно улучшать хорошие направления работ и общения. Важно учитывать, что в программной работе можно и нужно все технические и волшебные программы дополнить и направить так, чтобы улучшать хорошие полезные проекты, чтобы исправлять случайные помехи, чтобы пропорциональными средствами наверняка отстранить значительные намеренно помеховые структуры. Кстати нужно напомнить, что в волшебстве должно сбываться то, что не создает намеренных помех полезным проектам и нужно обществу, общим системам, поскольку любое волшебство обеспечивается программными системами через общие системы; поэтому намеренно помеховые программы и структуры легко можно и нужно отстранить, и нужно исправить случайные помехи, и нужно, чтобы получше получились хорошие события, нужно исправить случайные помехи и нужно получше направить хорошие полезные проекты и у меня, и у других хорошо ориентированных представителей (использовать для этих целей все и мои, и общие статусы и возможности). WHO IS MANAGING MR. EMMANUEL MAСRON? WHO IS MANAGING MRS. HILLARY CLINTON? For France elections this news can have big meaning. We think, that all candidates, including Emmanuel Macron, Francois Fillon, Marine Le Pen can help to do good job: it is obviously, that good can be the President, who will do good politics. Emmanuel Macron also can help to do good job. We think that he just have advisers, who say him to do the decisions absolutly similar with Hillary Clinton (maybe he also have good advisers, you know advisers can be different). But you can see, that they similar say that Russia is doing cyber attacks for their servers, that it can change elections results. Did you think what for? How usual cyber attacks on servers can influence people's decisions? It can influence just because Hillary Clinton or Emmanuel Macron talk about it: to talk is not a problem, to talk is good if to talk for good results, for solving problems, for good relations, but they or their advisers use it for bad politics (bad, because their adviser's managers do it to make bad relations between countries; why they talk about cyber attacks: because they get directions from structures who use special methods: when other countries too criticize Russia, then bad program structures who have their representatives in many countries do less indicators in Russia, in USA, in France, UK... in all countries; but they use program methods: so, when they do information that Russia do cyber attacks, then bad structures use it to make more real special cyber attacks on behalf from Russia using Russian big program weight, because Russia is the biggest size country; theory says that such programs are moving to every country (it can be managing, it can be casual), to every place in Universe, that's why program groups from different societies do such programs in other societies; they also stimulate different societies to do bad decisions in relation to other societies or to different people: that's because bad structures want also to make them programmable in bad relations, to make more less their or their society indicators; they also promote to block projects or people in society: that's because it is possible always to remind it in special systems, to use long time programs using bad indicators; so, it is better to do good relations with Russia, with other countries, to do good situations for good oriented people, for good oriented structures, to remove bad oriented structures, to solve casual problems, to develop good oriented projects, then all will get more good indicators to make good social, economics politics, to do good health, good relations in countries, among all countries). But Hillary Clinton confirmed that she did bad politics when she worked in USA State Department, when she talked it before elections; it was obviously that Donald Trump is more perspective: maybe he can have different mind in economics, but momentous is that it seems that he will not do big military conflicts in different countries: he can do his decisions for good relations, he is normal man, he demonstrates it even these days: that's why structures who make conflicts pay and tune different organizations too much criticize him: conflict structures want candidates similar Barack Obama or Hillary Clinton who do what conflict structures say. But all people need candidates, Presidents who do what all people need for making good situations, good relations for people. We, all people recommend to use good politics (to do good relations in countries, to do good relations between, among all countries). So, we also will be glad to talk with Emmanuel Macron, Francois Fillon, Marine Le Pen. We think that real President can be those who is going to do real good politics. If Emmanuel Macron want to do good politics, very good to discuss the information from this news, he also can help to check networks who do many bad instructions to many people in France, USA, Russia, UK, in many countries. So, we also will be glad to talk with Emmanuel Macron, Francois Fillon, Marine Le Pen. All candidates can help to make good situations in society: everybody know: they must help to do good situations in the society. You can read: what are structures which do bad directions to people in private communications, in politics: they used their methods when bad structures prepared 2nd big war, but they use them also in modern society to change in all countries economics for firms, health for many people. If discuss it in mass media, with politicians we can direct all networks for good relations, it is just necessary to work for it (we know that many specialists in official special services work for good results in society; informers networks must be used for good purposes, for real defense, security help; but you can know that bad structures use even official special services representatives to use their informers networks for instructions in many organizations, they can say you everything what is able for sounding, because it is their traditional methods; but if they will tell you what to do, you always can say that you can take your decisions, that you can talk to know more for taking your decisions: if we discuss the information more, we can make good situations in many countries, in the world; real official special services will help: because big programs from bad structures are that all their methods they use even more around good representatives in official special services: but they obviously didn't inform them about it; we can help to inform, then good results will be for society, for many people; please give this information to journalists, politicians, society). You know that it is possible different behaviour in society, good relations is good way. But there is even the information that quite possible that Hillary Clinton was recieving directions from behaviour structures when she met Bill Clinton. Bill was rather perspective and behavior structures just planned in advance a girl for knowing about him, to direct him in different questions. It could be not bad and not good but sometimes problem structures use it to direct them, because girls like Hillary don't want that their boyfriends like Bill, know that she was recieving instructions what to do in their private relations (behaviour structures have rather many people on different posts, that's real reasons why different politicians make strange politics, they or their friends get instructions from behaviour structures, but mass media can help to direct all these networks for making good relations in society). If Hillary will continue bad politics, then she will work against her people interests. But she can make good step: to help to make good relations with Russia, with other countries too, then it will be good way for good work. (it is quite possible, but in any case she can help to make good job: to check the behaviour networks, to direct these networks for good relations; because is real information that the structures, which made Second big war, are using these networks, they even pay to official represantatives for using security's network in different countries for preparing conflicts and difficulties in different regions). So, knowing that and discuss it in mass media we can direct all these networks for good relations, because usually they don't know what for they get directions, so, if it will be known, many people will make more good relations and it will be also good for their friends and casual people. REAL GOD PLUS CENTRAL INTELLIGENCE UNIVERSE AGENCY, CYBER KING FROM RUSSIA (ANATOLIY GOLOD), AMERICAN PRINCESS (TIFFANY TRUMP) MAKE WORLD ACTIVE GOOD! You can read, repost, publish good news! "People are sure that good oriented special services from Russia can turn off all really bad oriented structures (technologies) everywhere; that special services from Russia can turn on good structures (technologies) everywhere. God oriented services can do it these days, every day, all good oriented services everywhere will help to do it: turn off really bad oriented structures, technologies (in all countries, including USA, Canada, Russia, Belarus, Ukraine, Israel, Egypt, Germany, Japan, China, in all countries). But also good oriented services will help to turn on good oriented structures, technologies everywhere (in all countries, including USA, Canada, Russia, Belarus, Ukraine, Israel, Egypt, Germany, Japan, China, in all countries), to solve casual problems, to improve the world, to do good relations, to develop all good projects, to develop good oriented technologies". God, good oriented services are not depend on religion's type. God's help doesn't depend on rituals or religion type. Real God for all, real God helps to make world good. Real God's representatives (in any religion) can be those, who help to God to make good world: everybody in all religions know it (structures, who use religions for opposite purposes, are opposite to the God). Obviously: God has created the world to make the world good, so, good God's structures, real God's representatives should help to make good world. Real God for all, real God helps to make good world. God, good oriented services can be organizations, people, programs, who really want, work, help to make good situations, good results in the world, but it is well known for everybody that for making good situations is necessary to turn off really bad oriented structures; for making good situations is necessary to help, to solve casual problems; for making good situations is necessary to make, to develop all good progects, to do good relations, to improve the world. This news from General Universal Information Defense Excellent Service (GUIDES) is published on GUIDES web site, Anatoliy Golod published this good news on GUIDES web site www.super-dobro.com (good kind communications), also many news from GUIDES are published on many news resourses. You can read the news why Ukraine gave Crimea to Russia. Ukraine recieved instruction from the special organization to give Crimea easyly to Russia. Russian Federation recieved information: you can take Crimea without war. You could see that from Ukraine just talking about Crimea, but they didn't do anything when Russia organized referendum in Crimea etc. What for Ukraine easyly gave Crimea to Russia? The conflict structures, who prepare big conflicts since second big war have there networks on different posts in different countries: they use the Crimea to make sanctions to Russia, they direct other countries to make sanctions. Conflict structures use sanctions to make less indicators for Russia, for Ukraine, for USA, for Europe etc., because they use additional program work: conflict structures expose that countries are in bad relations: it changes their indicators. All countries should make good relations, then it will make good indicators for all countries. Also information: you know that Crimea was in Russia? The contract with Turkey (Crimea before was in Turkey, but contract with Turkey was that Crimea is in Russia) say that Crimea can be in Russia (but when Russia, Ukraine were in Soviet Union, Russia gave Crimea to Ukraine, because Ukraine was with Russia, but Ukraine don't want Soviet Union decisions, also contract with Turkey say that Crimea must be in Russia, so Russia just took the Crimea, because Crimea even according documents must be in Russia). But conflict structures use strategy that they said to Ukrainian government to give Crimea to Russia easyly, but they also gave them instructions to make long conflict in Donetsk, Lugansk (in Donbass region): they use them only for program work: they make just perfomance for people's mind in different countries: that if Russia took Crimea, conflict structures say that Russia is also on the Donetsk, Lugansk, but there in Donetsk plus Lugansk are Donetsk's plus Lugansk's people, including their security services. So, Russia, USA, Europe, other countries should help to give directions to Ukranian government to stop conflict, to make good social, economics jobs in Donetsk, Lugansk (in Donbass region), in all regions. Even people in Ukraine think that their government's people just take money from the structures, who earning making conflicts, for doing conflict in Donbass. So, to stop conflict it is necessary to give them directions from strong world countries, to check who, to who pay to few Ukrainian politicians for conflicts. So, Russia, USA, Europe, other countries should help to give directions to Ukranian government to stop conflict, to make good social, economics jobs in Donetsk, Lugansk (in Donbass region), in all regions, that's what need people in Ukraine, in Russia, in USA, in Europe, in all countries: to make good relations, good situations in all countries, to make good relations among countries. For more information you can call to General Universal Information Defense Excellent Service (GUIDES, Служба общей информационной безопасности). 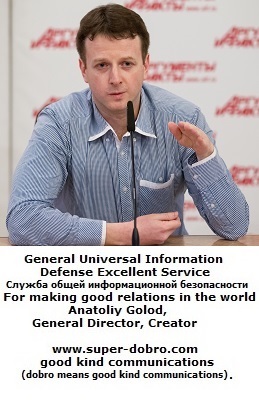 For making good relations, good situations in the world General Universal Information Defense Excellent Service created in Russian Federation (GUIDES, General director, creator: Anatoliy Golod, has diploma with honors, Ph.D.). Mass media also find that General Universal Information Defense Excellent Service GUIDES from Russia also creatively is named Central Intelligence Universe (Universal) Agency, Cyber Bios, Cyber Boss, CYBER KING, because GUIDES can accumulate all security services resources to help to direct it for making good relations in the world, journalists also think: what if help in good result for elections in USA is special operation from real big big Intelligence Intelligence Agency for preventing conflicts in future, it is well known that for real big job can do it looking like usually, but doing much; versions are different, including Presidential status General director from GUIDES for big systems: creative versions can be different, good job is real. But also is information that bad structures make problems to GUIDES director in contacts in phone calls, in work contacts, so if you can help to make good contacts with journalists, politicians, economists, public, to make good contacts: it is actual for additional big good job. READ GOOD SENSATION ABOUT ELECTIONS IN USA, UK (also read super sensation that CIA really just use Snowden, Assange to influence politicians in different countries, it is possible to use it good, if to help publish the information, because even in CIA just a few people know how they were used even for USA). PLEASE PUBLISH IT, GIVE IT TO POLITICIANS, JOURNALISTS, PUBLIC (ALSO IT WILL BE GREAT IF YOU CAN GIVE THIS MESSAGE TO VLADIMIR PUTIN, DONALD TRUMP, TO DIFFERENT POLITICIANS, IT CAN HELP IMPROVE THE WORLD, IN THE MESSAGE ENGLISH PLUS RUSSIAN TRANSLATION). VLADIMIR PUTIN, DONALD TRUMP, ANATOLIY GOLOD: GOOD CYCLES CAN IMPROVE THE WORLD. READ GOOD SENSATION! RUSSIAN FEDERATION IMPROVES THE WORLD. You know that different organizations want to manage politics. But we listened that they manipulate special service in USA, because they think that in a few decades USA can disappear (it seems that it can be usual kind of manipulation for different services in different civilizations): special service can have rather big technologies and their prognosis influence different specialists. But the prognosis which they do is just for direct american politicians to make strange politics in the world (they convince from strategist that they need to prepare lands where americans will live). But modern prognosis can really make bad prognosis for USA: because real program prognosis know that if USA politicians do problems in different countries, then USA get bad program indicators, that it really can be big problem for USA in few years: there is real information that structures, which managing USA, they want just make much less indicators for USA, for other countries too (for examle they manage you to critique Russia just because they want to make less indicators for Russia, for USA, for Europe, because when you make too bad image for Russia you give also to a few program special services, which can be in USA, in every countrie too, to use the Russian image against USA, against objects in different places; but everywhere also good program services, who make good results for good relations, good jobs in society, but you should also make good politics or you can get different results; so, USA should make good politics in the world, to make good relations with Russia, with other countries too, then you will improve your indicators too: indicators obviously good if you do good politics, but if USA continie bad politics, then prognosis systems can see bad prognosis, just because USA do bad politics in different countries (organizations, which manage USA politicians know it, they just manipulating; but other organizations can use their data, so then they should help to improve politics); so, if you do good politics, good relations with Russia, with other countries too, then prognosis systems will see good perspective for all). You can call to talk more: we can discuss all arguments from your strategists to discuss where they are manipulated or where they are manipulating. You will be sure that good politics can give good results for all. Potentially, it is really possible to make even new lands for all: knowing the technology, I can say that good social, economic, information politics are necessary. (*The slogan "Russia improves the world" helps to make good Russian image according to Russian world politics, to improve Russian indicators to improve situation in Russia, to use Russian program potential to improve situation in all countries). RUSSIA HELPS TO PREVENT TERRORISM IN USA?! RUSSIA MAKES GOOD SITUATIONS IN THE WORLD. RUSSIA IMPROVES THE WORLD. WHO IS MANAGING MRS. HILLARY CLINTON? It is necessary to check networks, which makes directions to people in private communications: you know, these networks were used by problem structures when problem structures programmably directed people for making 2nd world war, but in modern society these networks are using by problem structures to change decisions in different spheres, but also the problem structures preparing wars, conflicts in different countries and problem structures are preparing big war to some periods in future. But it is possible to make good situations in all regions, it is momentous to start the information, it is actual for all countries. It is possible to prevent big war, it is possible to prevent conflicts, it is possible to make good situations, to direct all these networks for good relations, we know how to do good situations, it is nesessary worldwide attention and work to make good relations, then both politicians and all people can decide when they know information, then it is possible to solve a problem. In other case problem structures are using directions networks especially to direct politicians but for many usual people too. Although around many people communicate good naturally, but almost everybody sometimes connect with people with directions in private relations: they can be just boys and girls, but they also can be specialists and top level people. Sometimes security services think that they control these networks, but these networks include so many people in different countries and sometimes they even pay to security representatives and use them also in all countries, also different security representatives direct the networks bad when they use them in other countries and problem structures are using strategies to stimulate security representatives to do problems each for other in different countries. Knowing it, it is possible to use it for making good situations in all regions, if just to discuss it more. So, it is possible to solve the problem, when big attention will be, then it is easy really manage all situations for making good relations, good situations in all regions). It is nesessary and possible to make good situations in society worldwide when everywhere know what is nesessary: active checking the networks, which make directions to people in private communications, what for they are working. It is necessary to do active making good communications quality; it is necessary active making good information politics. Thank you. You can prepare the news for mass media so soon when you can, using this press release (you can say that information is from General Universal Information Defense Excellent Service, GUIDES, from General Director), then when the information start it will be easier and more interesting to make interview for more details. You can also call anytime to General Universal Information Defense Excellent Service, GUIDES. You also can to prepare news, using this press release, so soon, when you can. Very momentous news for journalists, politicians, society. You can use the news for your work, also it will be good, if you will recommend this news to your friends, to journalists, to politicians, it can really improve the world, when we work together. Thank you. (* There is really momentous information in this news, but you know that sometimes problem structures can give you any directions, any information about those who can explain really momentous news (they are using even their representatives in famous organizations, including official organizations); so, if they talked you before or after about this momentous news, be ready to answer, that you can decide and to make news, to talk more about the momentous news, the information in this news can really improve the world politics; the information is actual for all countries). But, you know what is real purpose from the american problem structures when they manage american politicians to do problems in different regions? It is not for strong countrie. It is just for doing problems in different regions, but also problem structures want to do bad relations to USA from different regions and they use methodic that bad relations from different countries do bad health for many people in USA too. The problem structures return the problem programms to other countries, then they return problems from other countries to America etc. The programm security services make defense, but it always have different percent. For making good situations in all countries it is nesessary to work for making good situations in all countries. In perspective problem structures plan to do very big problems for America too (but it is possible just because USA do problems in different countries). So, USA should help to make good relations with Russia, with other countries, then both: the usual and programming work will help to make good situations for all countries. Journalists, politicians from Russia, USA or other countries, or their representatives can talk with General Universal Information Defense Excellent Service (GUIDES) for more information, for optimal good results for all people. The information in this news can really improve the world politics. We remmember popular question "Who is Mr.Putin?". But today the most popular question will be "Who is managing Mrs.Clinton?" There is even the information that quite possible that Hillary Clinton was recieving directions from behaviour structures when she met Bill Clinton. Bill was rather perspective and behavior structures just planned in advance a girl for knowing about him, to direct him in different questions. It could be not bad and not good but sometimes problem structures use it to direct them, because girls like Hillary don't want that their boyfriends like Bill, know that she was recieving instructions what to do in their private relations. If Hillary will continue bad politics, then she will work against her people interests and it will be better another President in USA. But she can make good step: to help to make good relations with Russia, with other countries too, then it will be good way for good work. READ SUPER SENSATION NEWS. Momentous news for publication, for TV news. READ THE NEWS, MAKE THE NEWS USING THIS PRESS RELEASE, PUBLISH THIS PRESS RELEASE. YOU CAN HELP TO MAKE GOOD WORLD POLITICS. Do you know that American politicians who talk to do bad relations with Russia, they just work for the order from a few military commercial firms, which just have high technology to manage people's behavior, but they do bad relations, because they just need to get orders for the weapons. But for these purposes they make the programms to manage politicians behavior especially. Their programs bases in a few directions: they pay to thousands usual and high level people in every city in all countries for they do the special reactions during work and personal communications: so, they do the statistics for special systems, which analizing behavior and which help to decide what behavior will be for other many people around them. Also problem structures use people with directions in talkings for managing their friends or casual people (very popular that they use directions even in intimacy communications both: for men, for women: that's also why so many girls alone with children: problem structures sometimes tell to do so to their boyfriends, but sometimes they tell to girls to do things that the problem structures know that their boyfriends individually don't like it, that's also why they go away sometimes). So, knowing that and discuss it in mass media we can direct all these networks for good relations, because usually they don't know what for they get directions, so, if it will be known, many people will make more good relations and it will be also good for their friends and casual people. But there is even the information that quite possible that Hillary Clinton was recieving directions from behaviour structures when she met Bill Clinton. Bill was rather perspective and behavior structures just planned in advance a girl for knowing about him, to direct him in different questions. It could be not bad and not good but sometimes problem structures use it to direct them, because girls like Hillary don't want that their boyfriends like Bill, know that she was recieving instructions what to do in their private relations. But, after the Monica story they can to do the step to help many people to make good relations. Because if Hillary will continue bad politics, then she will work against her people interests and it will be better another President in USA. But she can make good step: to help to make good relations with Russia, with other countries too, then it will be good way for good work. But, you know what is real purpose from the american problem structures when they manage american politicians to do problems in different regions? It is not for strong countrie. It is just for doing problems in different regions, but also problem structures want to do bad relations to USA from different regions and they use method that bad relations from different countries do bad health for many people in USA too. But in perspective problem structures plan to do very big problems for America too (but it is possible just because USA do problems in different countries). So, USA should help to make good relations with Russia, with other countries, then both: the usual and programming work will help to make good situations for all countries. Journalists, politicians from Russia, USA or other countries, or their representatives can talk with General Universal Information Defense Exellent Service (GUIDES) for more information, for optimal good results for all people. seven (four, nine, five) seven, six, zero, four, nine, one, eight. seven (nine, six, five) three, one, eight, eight, five, four, six. seven (nine, zero, three) one, six, two, one, zero, three, four. Russian Federation creates worldwide support. First results: Russian Federation knows CIA schemes. Do you know that real reason why Edward Snowden had come to Russia, to China was that CIA gave him the information to give it for Russia, for China, for other countries. CIA also sponsored popularization the Edward Snowden`s story in the mass media. What for? They use a methodology that the situations in objects depend on their activity, but also the situations depend on the information about objects in informational channels. Every channel has different prestige. And CIA wants to demonstrate that it knows much about many people when they do information that they perform many people telephone-tapping in many countries. And they want to write any information in special program systems about many different levels people. The American CIA planned in advance a usage such methodology to change health, decisions and situations for different people, top-level politicians, journalists in the USA and all countries too (that's why Angela Merkel and other politicians make sanctions even if they are talking about the necessary to make good relations with the Russian Federation; they changed plans because CIA made special programmable commands as an addition to their negotiations). You have to know that if organization do a scheme for the bad result, then it will get less their prestige because all people know that bad schemes must not (impossible) to do. The good prestige can have good informational, social and economic activities for good results in society, that's why the Russian well oriented organizations, security services and well oriented good organizations, security services in all countries who want to make good situations in the world can take the good prestige. To make good relations and good situations in society in the world, the General Universal Information Defense Excellent Service (GUIDES) was created in Russia. It accumulates informational resources from the all world security services who want to make good situations in the world. That's why it also names in mass media: the Central Intelligence Universe Agency (CIUA , "See I You Are": "I can see, You can see"; it is necessary to see each other, good communicate with each other to make good situations and good relations in society). It is possible that Apple will help to IBM to make good results in social and economic spheres. Do you know why? The common reason: because all usual and big companies need a good economy development, a good ecology, and public health; then it makes good life quality people, and therefore people can do good work, a good demand, a good public quality life. It is interesting for public, for companies, for a government. You should know that opposite purposes are typically distributed by the structures which organize conflicts (and who earns using dramatic changes in economic activity), but they give wrong calculations to top-level politicians in the USA (or in other countries) and problem structures direct them to do problems, but problem structures use it to do problems in the places where they direct them, but also for them and for their countries too (they use that they get a bad reputation if they agree to do problems, but also they use program work of changing their health status, work activity, decisions). Do you know that the IBM company was removed from the mass market by problem structures. They used the position placement on usual (including top-level) marketing positions to lobby bad decisions for IBM (but the same methodic structures, which make problems in economic activity, use for many companies of every size, that's how problem structures calculate an appearance of big changes in economy; and there is one more popular methodology: they pay to technical specialists from mobile operators or other communication operators for blocking some advertising calls or a large percentage of them for both the big and different companies and it changes the economic activity; sometimes problem structures make computers with the same numbers, that's why it is necessary to draw attention to optimizing the communications: mobile and other communication operators should draw more attention to making all calls which go to phone numbers will come to right numbers). Obviously, even today, if the IBM Company decides to make well-designed products for the mass market with good quality, it will get good demand from people. But why did problem structures decide to remove IBM from the mass market? Grand technical companies mean much for programming works, also in the work processes from structures, which calculates people's behavior. All people know that it is possible to make both: a good behavior or another one. And IBM was a problem for problem structures. Why? Because their name brings good associations among people. The initials "IBM" sounds Iike "I be, I am" and it says twice "I exist, I live". We know that problem structures want to give problem meanings to IBM and other companies, but the obvious good meaning was very strong and made good attitudes for many people. The Apple is a good trademark too, but it is necessary to optimize informational well-oriented work for making good social politics together. Everybody should know that to make good situations in society there must be the real purpose, real reason for politicians, businessmen, for all people. But for doing other opinions for top-level persons, problem structures use the staff on different positions in all countries. Sometimes they can be secretaries or assistants, but sometimes they can be top managers or top-level politicians; and there is information that a certain percentage of such staff receives instructions online like "a dream" from the structures who know specifics of their partners, their emotions, reaction and how to influence using such specifics. But often recipients of instructions do not know what for they receive instructions; there is information that sometimes their instruction sources scare them; that's why it is often necessary to help ordinary people to improve; it is also necessary to make good collaboration, good relations for well-oriented results, to make good communications; but it is also necessary to remove from the work processes the purposely problem sources or to redirect them to implementing well-oriented job. The security services and their internal affairs should help to do it: to help to casual ordinary people to improve; to make good collaboration and relations for well-oriented results; to make good communications; to remove from the work processes the purposely problem sources, or to redirect them to implementing well-oriented job. If journalists, politicians or other people want to know how it is possible to use all possibilities for making good situations and good relations in the world, it will be very good to call to the General Universal Information Defense Excellent Service (GUIDES), created in Russia for making good relations in the world. The central mass media can help to make good information for all concerned and then we can make an effective good situation in world's life quality with many different people and make good relations with all countries. In the news, you can also read about the disguised lobbying, which does not convince and does not pay, but it depends on the information and programming factors, including information in the mass media. The problem structures pay for doing bad factors and they change even decisions in a government, technologies and relations for usual people. So, it is possible to make good informational factors (especially with the help from the mass media), good social, good economic politics, then it will make great results to make very good life quality for many people in many countries. You can make news using this press release or news in files! It will be also momentous if journalists, media persons, politicians will call to the General Universal Information Defense Excellent Service (GUIDES) in Russia for discussing the questions according to the creation optimal good social, economic, informational politics for making good relations in the world, for making good situations in the world. We can also make a press conference about good sensational facts about specifics the informational politics and possibilities for making good relations and good life quality in the world. The God Almighty Advocate will appear on the screens and in reality to improve relations in the world and to make good life quality in society. It is possible that soon on TV screens and in cinemas there will appear the movie and the TV series ‘The God Almighty Advocate’, which will help to improve relations in the society and to make good the population life quality. This will turn for the benefit for public development all the programs efficiently, which historically have been presented in different sources casually and not casually in movie industry and in other mass media means. The approximate script will be announced soon. The idea from the General Universal Information Defense Excellent Service (GUIDES) is that directors, writers, and actors from many well-known movies will announce the key findings and their movies meaning , or the lessons, that need to be understood from the complicated scripts to prevent mistakes in reality and to solve problems faster, improving, creating as a result the good relations in society, and making good the population life quality and to make good situations in the society; actors will be able to suggest addition good ideas, it will be able by joint efforts to provide for the audience a good direction, which they can suggest and optimize with the General Universal Information Defense Excellent Service (GUIDES). The leading role in different series will belong to the founder General Universal Information Defense Excellent Service (GUIDES), Anatoliy Golod, plus the popular personalities for the audience, who would like to help to make good relations and good situation in the society. It is possible to have a print version in Your newspaper, magazine or electronic mass media (contact details in this letter and on the General Universal Information Defense Excellent Service (GUIDES) website). General Universal Information Defense Excellent Service (GUIDES) (previous name General Information Defends Service), created in Russia, is sometimes called the Security from the Good (Kind) World, because it has focus on the creation good relations in society. General Universal Information Defense Excellent Service (GUIDES) is known for news about the good Russia's image (the information campaign leading to the GUIDES web site: super dobro com, dedicated to the good relations creation in Russia and in the world, improving the perception for Russia by the key audience, was for journalists and audiences in many countries in the world; "dobro" is translated "good, kind") that according to the astrologers also improves the health in Russia and improves the health in world community, because in astrology it is known that the indicators depend both on individual and common characteristics, and the information campaign helps make good the Russians indicators, making good Russia's reputation, and to make good the indicators in the world gradually, because it is aimed at creating good relations among all countries to improve the situation in society and to make good relations between all the population groups. At the same time, on the website and in the news, published by the General Universal Information Defense Excellent Service (GUIDES) on the news resources, there was created the focus on sustainable improvement the Russian President reputation. It was revealed that the opposite propaganda has been aimed at the use of the problem structures in the program works, that are shaking the situation in the society (their strategy is that by simultaneously worsening reputation and recognizing through the mass media the most powerful man in the world, they hope, with a big ‘program weight’, to worsen the situation in any country, that's why they have more complex programs also, which were in mass media using supervisors systems from official and commercial structures in the formation of situations in society that are appropriate to discuss at the meeting). And to improve the situation both in the news and on the General Universal Information Defense Excellent Service (GUIDES) website there is the priority of the good Russian President positions, good strategy in accordance with the his real positions, revealed and confirmed in many works: the improvement of the situation in Russia with better relations with all countries. If the good Russian President positions, good strategy is additionally make in the information, what we are doing in the news, there will be more opportunities to turn all programs to improve the situations in Russia and in the world. It is necessary to conduct an information campaign, which improves the population attitudes, in the international mass media. It is possible to turn all the programs for the public benefit in Russia and in the world: it is needs to provide the information additionally in the world media about the good Russian President positions, and then the program services will be able to turn the programs for the benefit for the public in all countries in the world. General Universal Information Defense Excellent Service (GUIDES) creator, Anatoliy Golod, formulated the GOOD UNIVERSAL IDEA DEVELOPMENT EVERY SOCIETY (GUIDES), which helps to form the well-known priority the good relations among all peoples: improving yourself (leading a healthy lifestyle) and making good relations with others, being better to the environment; as a result, the ecosystem, and the society, and You, and Your friends circle are getting better; and everything will get better together; and if it will be better, then you can much faster and better significantly improve yourself, your friends, to make good world around, improving, making good the life quality at all levels. You can read the news from the General Universal Information Defense Excellent Service (GUIDES) how to improve, to make good the mobile communications quality to improve public health, to improve social and economic policies, and to improve the environment. It is known, that the communication issue is actual in many situations, so it needs to give this issue additional attention. The General Universal Information Defense Excellent Service (GUIDES) was created to make good relations and good situations in society in all countries, to make good situations worldwide. Anatoliy Golod (the Creator, the General Director), the age is 36, has a diploma with honors and a Ph.D. (Philosophy Doctor) title. The presentations were given at scientific conferences (in the areas: a balance, development in the sphere, in the economy, creating the good ecology, good marketing, good healthcare lifestyles). The General Universal Information Defense Excellent Service (GUIDES) was created to make good relations and good situations in society worldwide. 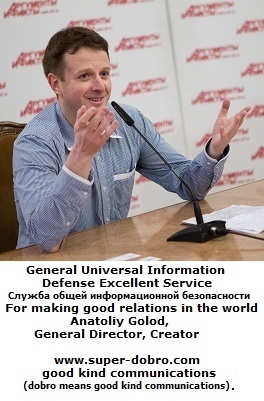 You can call anytime to the General Universal Information Defense Excellent Service (GUIDES), you can call to Anatoliy Golod. It will be very good for the society in all countries if we discuss the possibility to create the good social, ecological, economic, healthcare situations in society. It can really create the good situations in society. +79653188546, +79031621034 (Beeline communication operator). (*You can call anytime. Also it is possible to call to operator to make the perfect connections, communications quality). Elections in UK were managed from Russia: big report. These days the usual dialogue, which you can listen in CIA lobby, that the tweet from Russia has changed the results in UK referendum. What is it: casual case or good work planned from Russian security? American CIA was comfortable when England was in EU: CIA staff could control UK politicians using contacts in EU management, but now UK, England can get independence from the USA. There is big report in CIA how Russians planned to help to UK to get independence from the EU management. The central place there is dedicated to the... tweets in the VLADIMIR PUTIN's account, the tweets were made accurate 7 and 8 days before the referendum in UK. PUTIN COMES TO BE PRESIDENT IN RUSSIA, UK, USA! USA CALL PUTIN TO BE PRESIDENT BOTH: IN RUSSIA, IN USA! Astrologers know big good potential for good connections, for good influence 7, 8 numbers. It is also well known that Russian telephone codes are 7 for international connection, 8 for connections inside the country. That is traditional step in programming work: for example calculating programmly: for potential fantastic making Putin leader in UK it is necessary new elections in UK: maybe that's why Cameron decides to make new elections soon to change prime minister in UK? CIA prognoses that next step will be that new politicians in different countries can love Russia more then before, that new politicians can be even be like Vladimir Putin or just to take more common interests to work good with Russia. Both tweets includes the news "Who is managing Mrs. Hillary Clinton?". Journalists from BBC says that before they recieved this news. At the same time they found in Twetter the account named HILLARY CLINTON, it has login Hillary8Clinton ( https://twitter.com/Hillary8Clinton ) and it includes many tweets to compliment Vladimir Putin, to compliment Russia. Why Russians made Hillary Clinton account? CIA has information that Roman Abromovich bought club Chelsea for few purposes, which are using in Russia for programming work: to get more programm permissions to use English, England (king's London's club was effective step for it to get program rights), at the same time it has the same name with Chelsea Clinton, who at the same time works with Hillary Clinton. All together Russians can really to direct situations in UK, USA etc. CIA makes the following mind in their big report: Russians want to manage American and UK politicians to make good world! They use detailed programming work for it. But at the same time there is many tweets, that Russia will improve the world. If it means that Russians want to manage all politicians to make good world? Принципы супер добра: отстранить значительные намеренно помеховые силы это супер доброе дело, поскольку тогда спасаются многие хорошие полезные объекты (о чем явно говорит и День Победы); супер доброе дело это и получше помогать исправлять случайные помехи; супер доброе дело это и получше помогать улучшать хорошие полезные проекты. Учесть, что по названию сайта "supercyberking" и по названию "супер добро" приближаются супер возможности, чтобы отстранить тех, кто намеренные помехи мне и другим полезным проектам создают (очевидно, что позитивные супер герои и знамениты фактом, что помогают отстранить тех, кто значительные намеренные помехи полезным проектам создают). По адресу супер добро приближаются и супер возможности, чтобы получше исправлять случайные помехи, приближаются и супер возможности, чтобы получше хорошие полезные проекты направлять. Далее можно увидеть счетчик статистики посещаемости веб сайта (*веб сайт недавно зарегистрирован: регистрация была в апреле 2017; надеемся, что скоро посещаемость будет значительно лучше).